Whenever I have a two-show weekend, the shows seem to synchronize and theme. When we saw the Austin Lounge Lizards and She Loves Me, the theme was synchronicity, for the last time we saw the Lizards is when we saw She Loves Me. When we saw Dear Evan Hansen and A Bronx Tale, the theme was “the choices that we make”. For The Accidental Activist and Finks, the theme was “accidental activism”. Last weekend, when we saw Steambath at the Odyssey Theatre Ensemble (FB) and Remembering Boyle Heights at Casa 0101 (FB), the theme was “fighting death”. During Remembering Boyle Heights, they said something quite profound: The first time you die is, well, when you physically die. The second time you die is when you are buried, and your physical body is gone. The third time you die is when you are forgotten. Steambath was about someone fighting the first time you die. Remembering Boyle Heights was about fighting the third time you die: it was a play dedicated to the mission of remembering what the community of Boyle Heights was, fighting the changes that are working to destroy the community, and starting the project of preserving Boyle Heights and its unique history. For those unfamilar with the community, Boyle Heights is a community just E of downtown Los Angeles, on the east side of the LA River, between downtown and City Terrace and East LA (which is actually county land). To the north is Lincoln Heights; to the south is the city of Vernon. It’s intersected by the 101, 5, 10, and 60 freeways. First the home of the indiginous Tongva, and then the Spanish and Mexicans, it eventually became home to Andrew Boyle. After that, it became the working class community that everyone who couldn’t live elsewhere due to red-lining or restrictive covenants lived: the Jews, the Japanese, the Mexicans, the Blacks, the Russians …. . It was a working class, a bit socialistic. It is where the bagel machine was invented, where Cantors Deli got its start, and where the first hispanic city councilman got his start. It was home to the Breed Street Shul, one of the first major synagogues in Los Angeles. For me, when my dad first moved to California, he moved to City Terrace. For the longest time he kept ties with the community, keeping bookkeeping clients on the “eastside” (I’d even help him pick up and sort the paid bills). I remember visiting the Villanueva’s at Mi Tienda, and the folks at the La Victoria Candy Company (both appear to be gone now). I can’t remember the others. Then the show begins. It is organized as a tour with seven stops. The first is a Gentrification Town meeting (that invites audience participation), wherein the actors portray all the sides in an argument about the benefits and detriments of gentrification. The second stop introduces us to what Boyle Heights is and a bit of its history. The third stop explores the various foods, culture, and music of Boyle Heights, with ample attention to the Jewish, Japanese, and Hispanic nature of the community and how they blended and worked together. The fourth top looked at the social, faith, and political aspects of the community, including all the political and labor actions. The fifth stop explored Roosevelt High School and the culture of the school in the 1920s and 1930s. Then came WWII; the sixth stop explored the impact of the Japanese removal on the community. The last stop explored (briefly) post-WWII and the rise to power of Edward Roybal to the LA City Council. After the show we had a panel discussion on the food and fashion of the community and the show, with special panelists Shmuel Gonzales (FB) and someone who does fashion whose name I can’t remember. As you can see from the above, this wasn’t your typical show with a plot, characters, and a through story line. It was more of a history and culture lesson about the community. In fact, it is planned as the first of many such shows; they want to continue the story as the community evolved from the 1950s — the exodus of the Jewish families to West LA and the Valley, the interplay of the Hispanic and black communities; the growth of other Central American cultures, and the gentrification and preservation battles. In many ways, this show evoked memories of This Land, which we saw at Company of Angels at the end of 2017. That show told the story of a plot of land in Watts, a community in South LA, and how it had been passed from the Togva to the Mexicans to the Whites to the Blacks to the Hispanics … and was being gentrified again. It demonstrated how our cultures could learn from one another and cooperate. The history of Boyle Heights is the same: different people from different backgrounds finding the common ground and becoming friends, not dividing apart and segregating. So while, when viewed as purely theatre, there were some minor structural and performance problems, those faded into insignificance when compared to the message and the story that was being told. Los Angeles does have a racist history that must not be forgotten, but it also has a rich and diverse multicultural story to tell — a story of different cultures coming together in communities like Lincoln Heights, Boyle Heights, Watts, Inglewood, Pacoima, Arleta — working class communities where it was hard work that mattered. As an (amateur) LA historian, this show was a pure delight. As someone with a connection to Boyle Heights, … well, it was even better. The performance side was truly an ensemble piece, with everyone working together. The cast consisted of: Michael Berckart (FB), Joe Luis Cedillo (FB), Jose Alejandro Hernandez Jr. (FB), Yvette Karla Herrera (FB), Ángel Michel Juárez (FB), Megumi Kabe (FB), Marcel Licera (FB), Jackie Marriott (FB), Roberta H. Martínez (FB), Allyson Taylor (FB), and Raymond Watanga (FB). All were great. I particularly liked the per-tour performances of Juárez, Herrera, and Cedillo; the general tourguide and Jewish father of Berckart (who we saw in Paradise); … oh, they all were great, come to think about it. Each had their own special moments. Turning to the production side: the set design by César Retana-Holguín (FB) was simple — benches and chairs and some artwork on the side, augmented by the projection design of Masha Tatarintseva (FB) as well as live video shot throughout the show. Establishing place and time even more were the costumes of Abel Alvarado (FB) — they were reasonably period and culturally appropriate (Ashley Montoya (FB) was the wardrobe supervisor). The sound design of Xavi Casanova (FB) and Vincent Sanchez (FB) provided the appropriate sound effects and music, and Kevin Eduardo Vasquez (FB)’s lighting design established the mood. The production was written by Corky Dominguez (FB) and Josefina López (FB), and directed by CD. Andrew Ortega (FB) was the Asst. to the Director. Our friend Shmuel Gonzales (FB), the “Barrio Boychik” who gives tours of Boyle Heights, was the Production Consultant. Xavi Casanova (FB) was the Production Stage Manager, and Georgina “Gina” Rios Escobar (FB) was the Asst. Stage Manager. Josefina López (FB) is the Founding Artistic Director of Casa 0101; Emmanuel Deleage (FB) is the Executive Director of Casa 0101. 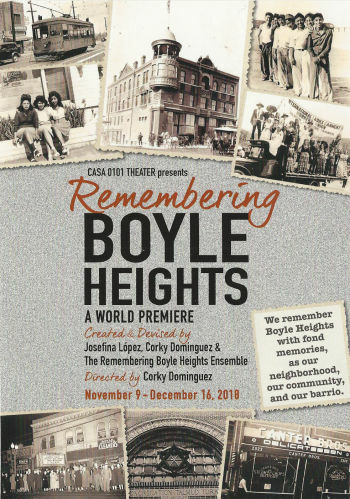 Remembering Boyle Heights continues at Casa 0101 (FB) until December 16th. Tickets are available through the Casa 0101 website; discount tickets (in combination with dinner) may be available on Goldstar. If you are a lover of Los Angeles, and especially if you love Los Angeles history, this is the show for you. December starts with the Annual Computer Security Applications Conference (ACSAC). It will also bring Come From Away at the Ahmanson Theatre (FB). Other than that, December is open while we recover (other than the obligatory movie on Christmas Day — our one day a year for filmed entertainment).